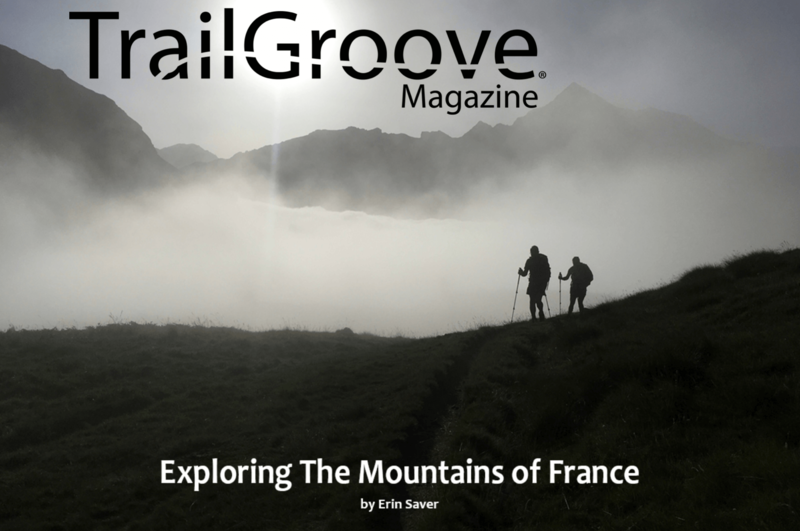 I recently had an article published in TrailGroove Magazine that gives a nice overview of my thoughts on thru-hiking the Pyrenees and French Alps. For those of you that have been waiting for more of an advice post on hiking in France, this was just the impetus I needed to finally put something up on the blog. First, read the TrailGroove article; it concisely addresses most of the unknowns many have about hiking over there, especially if you are not accustomed to hiking in Europe. For the sake of efficiency, I think it will be best if I just do a list that answers some of the most frequently asked questions pertaining to hiking in France. I know I tend to do a more thorough breakdown in my post-trail advice, but honestly, hiking out there is pretty relaxed with a lot of resources and accommodations. I feel like a seasoned backpacker or thru-hiker could review a guidebook (I used the Cicerone guidebooks), grab their pack with a few days of food, and just head out with very little planning needed depending on what they were doing. At the end of my list, I will give some specifics on the two routes I hiked; the Haute Route Pyrenees and the GR5. Please let me know if I leave anything off this list, and I will add it. This is just what came to mind. Depending on each year’s snowpack, the window for hiking tends to be late June-Sept with June and Sept being shoulder months. Even October is sometimes possible (more so the Pyrenees than the French Alps) for some that don’t mind possible snow and cold weather. Many people enjoy the ease of European hiking as there are often refuges that provide shelter and usually meals at a price. Some do hike routes with refuges without a tent, and sometimes without a sleeping bag if the refuges provide sheets and blankets. Refuges were usually around $15-20 for a night. Dinners were ~$10, and other meals were less. YES, it is possible to legally camp in the Pyrenees and French Alps. Most refuges have an area for free tenting. It IS possible to wild camp as long as it is well away from the trail, and what they call a bivouac; generally after 7 or 8pm and leaving early in the morning. There are usually abundant water sources along the trail, and plenty of public drinking fountains in villages and at refuges. Guidebooks are written with the intention of allowing the hiker to end at a refuge or village most, if not all of the nights. If staying in France for fewer than 3 months, it is not necessary for most international visitors to apply for a visa. Be sure to double check this with your own research. If you use an alcohol stove, many villages have Alcool a Bruler (France) or Alcohol de Quemar (Spain), which is in a white detergent-like bottle in the cleaning section, and similar to methylated spirits. Beware that operating hours for post offices, general stores, and grocery stores are NOT 9-5. They tend to close for a chunk of time midday ~noon-3pm. This tends to be fluid, so you just have to go with the flow. Also, many stores may close on Sundays. Public transit via train in Europe is pretty great. The BlaBlaCar app is AWESOME for saving $$ by carpooling! When you choose your country of origin for the app, choose the UK if you are only English speaking. It will load in the language of the European country you choose. SFR and Orange tend to be the two most used options for cell providers in France. Even if you are on the border of the Pyrenees, they will also work in Spain at no charge due to a new law in 2017. However, this does not apply in Switzerland along the French Alps, but it is not often that will occur. The options are a bit pricey, but not terrible. If you have a local French resident with SFR, they can get a 2nd SIM card for super cheap and you will have so much data you won’t know what to do with it all, but your friend will have to write a letter to end that contract when you no longer need it. If you are heading out after mid-July, on an average or low snow year, you will likely not need traction devices. I did the Haute Route Pyrenees on a low snow year leaving in early July and needed my traction devices just one time seriously and one time recreationally in the first half of the route. I recommend carrying cash just to be safe unless you are able to book the refuges ahead of time. It is fairly common to find an ATM in any good sized village. Guidebooks often list the time needed to hike each day’s miles, and that is very helpful when planning. As a thru-hiker in condition, I did find myself comfortably hiking 1.5 days of what the guidebook suggested, but know that had me camping and not landing at a refuge most nights. I did not experience any mosquitoes. I don’t know if that is unusual, but I didn’t need bug spray. The Haute Route Pyrenees (left) and the GR5/French Alps (right). The Haute Route Pyrenees is intended to be the higher route to take through the Pyrenees and is estimated to be ~550mi long. The current guidebook does not give mileage, but rather distance in time intervals of how long it should take to hike each section. I used Ton Joosten’s Pyrenean Haute Route Guide (2016) from Cicerone guidebooks. Tom Martens is working on the most updated version of this guide, and will likely announce it on his HRP Facebook Page. If you are able to read French, a popular guidebook that’s known to be even more adventurous is Jerome Bonneaux’s Trans Pyr’. The route you will be on, is not signed as the HRP, but often overlaps other routes and paths that are already clearly marked and defined. There is some cross-country (maybe 20% max) that is not on a clearly defined and marked path. The HRP lies between the GR10 on the France side; and the GR11 on the Spain side. Both of these actually have more elevation gain than the HRP because they go low almost daily to end at a village or refuge. The HRP chooses to take the higher and more exposed route that can often also require longer carries between resupply points. The HRP does overlap some well traveled areas where there may be groups of people for periods of time, but it is more often than not, in solitude. I highly recommend this route, but I warn anyone going to hike anything in the Pyrenees, IT IS NOT FLAT! There are few times when you will have a relaxed cruise along a ridge line. You are more often going either steeply up or down. However, I will also say that the HRP is the most scenic trail I’ve ever done per mile. There is hardly ever a time when you are not taking in a sweeping view. As for resources, here is a link to the folder of resources and gpx tracks I used. I’m sure more update information will come out in years to come. Here is the link to my detailed daily journal. The guidebook recommends 45 days for this hike without factoring in rest days. In thru-hiker condition, I was comfortably able to do the hike in 36 days with two zero (rest) days. Please note that the gpx track I used is from the older route, and has not been updated to match the current guidebook. It was sufficient, but PAY ATTENTION and don’t follow it blindly without cross referencing the guidebook. I have edited it some to match some of the major discrepancies. The Cicerone guide does have many waypoints you can manually enter if need be. I did that at times and found that to be reassuring. If anyone has an updated track I can put on my link, please email me! The only major note to know is that you will likely want to carry traction devices (ice axe on high snow years) if you start your hike in June or early July. The main passes for snow are right about the midway point. Day 17 in my journal describes the passes in detail and you can reference it in the guidebook. After that, you will not have a need for traction devices and can send them ahead or home. The intimidating crux of the trail (in my opinion) that is the only real exposure that I found frightening was Coll de Mulleres on my Day 18. If you don’t like exposure or heights, you’ll want to look at that before doing this route. Other than that, the route is just the right challenge for a nice high route, and I highly recommend it to those who don’t mind a workout, ha! 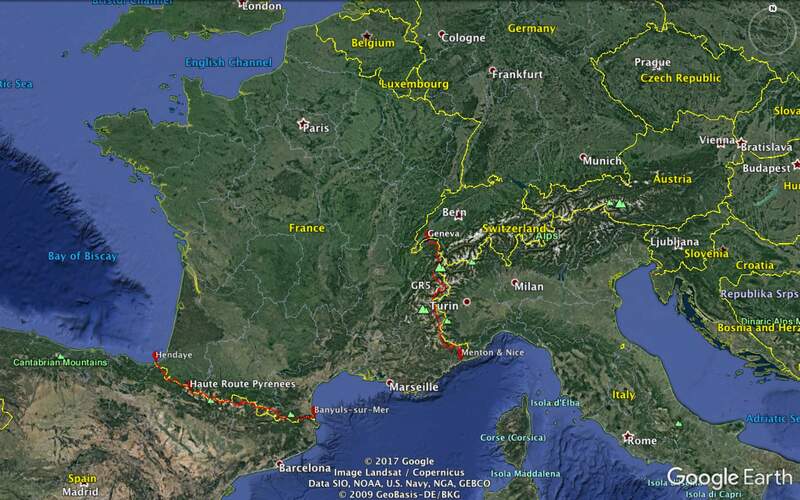 The GR5 is ~400mi long and goes from Lake Geneva to Nice or Menton. The GR5 does extend much further north for hundreds of miles, but this section is the one that everyone truly thinks of when referencing the GR5. The GR5 was the perfect blend of a hike for me. I’ve never been more relaxed on a trail than I was on the GR5. There were an abundance of options to seek shelter and/or get food if needed. Knowing that made the GR5 very laid back, and provided the opportunity for a very free formed hike. Many do this hike without a tent or even sleeping bag because the guidebook is setup in a way that has you landing in a refuge, gite (hostel), or village daily if you like. Although many do not tent, I was able to tent almost every night, and was only required to stay in a refuge one night in Vanoise National Park. Note that I was also hiking lengthy days that allowed me the ability to hike outside of restricted camping areas if need be. The guidebook I used was Paddy Dillion’s Trekking the GR5 Trail: Through the French Alps from Ciceron Guidebooks. There was another guidebook popular with the French speakers called GR5 Topo Guides. If you are looking to do a high route version of the GR5 that goes into fewer villages and stays in more remote and higher places, and you can read French; Jerome Bonneaux’s Trans ‘Alps guidebook comes highly recommended. Here is a link to my detailed daily journal. The guidebook recommends 32 days (not counting days off) to hike the GR5 with a commonly done bonus scenic ending in Menton. In thru-hiker condition, I was able to relaxingly hike the route in 24 days with a 1.5 day side trip to Chamonix (must do!) and a zero day for a snowy day early on. Here are some notes to reference for the GR5 because there are a few options to choose from. Using the guidebook and referencing the links I give here for my daily journal will help you to decide. Here is a link to the gpx track I used. Notice there are multiple routes there. The GR5, the TransAlps high route that many of the high alternates follow, and the alternate ending to Menton. The www.grfive.com site was a nice overview of the options on this trail. You have two options to start. Lake Geneva (longer and more gradual +1 day) or St Gingolph (I did, is considered the more official starting point, is shorter and steeper). That start isn’t on my gps track, but it is on the Swiss/France base maps you can load on the GAIA app if you use it. It’s also fairly well signed. Take at least one day as a side trip in Chamonix dropping down by cable car. Then go up to the L’Aiguille du Midi on Mont Blanc via cable car, preferably at sunrise if possible! Do the GR55 alternate through Vanoise National Park! Day 10 on my journal. It was a highlight of my whole summer in France! I also recommend taking the GR5B option before Briançon if you don’t mind skipping the village of Nevache. It gives you the option of hiking into Italy a bit, seeing some WWI bunkers, and likely some great wildlife. Finish the hike in Menton instead of Nice via the GR52 alternate through Mercantour National Park. This gives you the opportunity to hike through the rugged mountains of Mercantour National Park. You’ll only want to do this in nice weather as it is quite exposed hiking. The guidebook describes the other option into Nice, which pales in comparison. You will still be able to take a short train ride to Nice from Menton, but I recommend a night and some time spent in Menton first. What a great place to finish! Whew, I hope this is helpful for everyone. As I said, hiking out there is really straightforward with many resources along the way. You could likely grab a guidebook and just go, but looking at all of this will give you a good idea of what to expect and which alternates are recommended. Have a great hike! I too did not find any bugs when I was hiking. There are few campers except in camp grounds I was not bothered even in illegal camping, but there are few sites at altitude. You need a bag good to 35 degrees. Yes, good to clarify the difference in a gite and gite d’etap. When you say cooking, I believe you mean with a kitchen (may be lost in translation). And you mean that showers are 3 euros for anyone not reading that clearly. Wonderful post, Erin! It brings back so many great memories of hiking in Europe last summer–I want to go back! We stayed in huts and guesthouses while we were hiking in France/Italy/Switzerland. One important thing to be aware of for hikers doing the same is that the dinners are usually served between 6 and 7. Hikers need to time their arrival at their accommodation each night to make sure that they are there in time for dinner. We cut it close a couple of times, and, if you arrive late, you may be out of luck! Have a fantastic time in Nepal. I am really looking forward to your posts! Good to know Alison. I never had a dinner in a refuge, so I wasn’t aware of the timing. I actually thought it was later, but maybe that’s in town. I was also under the impression that meals took a bit of time as they tend to be served in courses and are quite social. Am I right? As always, very generous of you to take the time to help make following in your footsteps much easier. The high route has been added to my lists. All of the refuges/gites/guesthouses set their own schedule, but the meals tend to be on the earlier side as feeding a hut full of hungry hikers is a lot of work. We would ask other hikers on the trail that we met hiking in the opposite direction if they knew what time dinner was served, so we could plan our day accordingly. Dinners are usually multi-course meals and tend toward the gourmet side (at least by backpacking standards). Cheese course, anyone? The service is pretty efficient, though, as the staff is usually eager to get everyone fed and off to bed. The meals are quite social. In most cases, everyone sits together at long dining tables, and the food is served family-style. We really enjoyed them! There’s some good advice here. Pleased to see you enjoyed one of the best treks in the world (HRP). Eternal thanks should go to Georges Véron for his inspirational work regarding this high level route with lots of options – unlike GR10/11 it was never intended to be a fixed route. Hopefully you’ll be back to enjoy more of the wonderful European mountain areas. Thanks for all the great intel. I will be hiking the whole route in 2019. How many days food did you have to carry at any given time? Hmm, good question. I think the longest was a week and that may have been just one leg. The guidebook lays that out pretty easily. You pass likely at least one hut a day, so many carry little food and just use those to eat and not worry about a lot of food carries. Hi! I hiked the hrp last summer (best hike I’ve ever done with amazing scenery, solitude and mountain lakes) and am now looking for another adventure to do this summer. The GR5 is definitely an option, i was wondering which hike you preferred? And can anyone think of any other great long distance European hikes that could be an option? Maybe the GR11? And pyrenees vs alps? E5 is a fine route. A bit tougher is ‘An Italian Border Route’. See details of these and other routes (eg GR10 and GR11) on my ‘Postcard from Timperley’ blog. There are many brilliant European routes. Alta Vias 1 and 2 are a couple of my favourites. We are trying the Kalkalpen Traverse on the Austrian/German border this year. Well, I do go over the characteristics of the two in the article here and in the links. The Pyrenees are surely steeper and have more solitude I feel. I loved the more relaxed (but still lots of elevation!) terrain of the French Alps and the GR5. Plus, the ease of food out there as well. The GR11 & GR10 have more elevation change than the HRP. It’s a matter of personal preference I guess. Re: maps. I saw your caltopo gpx – did you use the caltopo printouts as your main map source? Most other sources I’ve read have used the IGN maps, so I’m unsure how reliable the TF outdoors base is as a navigational tool! Thanks. I did print the caltopo ones, but they were never brought out of my pack. Really, navigation down there is not difficult and my phone gps and guidebook was sufficient. I wouldn’t splurge on the real maps unless you really want to navigate off map and compass the whole time for fun. Thanks you. Interesting, I’ve heard so many mixed reports on navigation (usually erring toward the navigation can be a bit tricky). The concept of going without paper is bizarre for me, being new to this whole digital mapping stuff. I have found my phone to be a bit unreliable battery-wise, so don’t want to rely on it regardless. I’ll likely print paper maps from Gaia at the 1:50,000 or 1:25,000 scale and create a splice of the spanish and french maps. Probably the most optimal solution would be 1:50,000 printed and using the phone if I need more detail. Problem is the times where I would need more detail (cold, wet cloud) seem to be the times where my phone inexplicably starts to fail. *I should clarify I’m talking about the HRP. I have done a little of the Gr5, where navigation indeed was easy. I met a hiker doing the whole route with no maps. Yes, I agree about the times when fog comes in and that people should carry hard copies in all cases. I think the maps sold for the area are quite good but pricey if I recall. If you had limited time for the GR5 (12 trail days max), which section would you choose? I am thinking about starting in Briançon and head North, hopefully all the way to Chamonix. Does it sound doable in that time frame for an average fitness hiker? Would you recommend something else instead? That is a great choice given that timeframe. Not knowing your pacing, I’d check the guidebook and be sure that looks doable for your preferences. I was tenting, so I was able to be flexible and was sometimes doing 1.5-2 of the days the guidebook would suggest in one day. Having said that, it took me about 8 days to do the stretch you are mentioning, which is about 117mi/188km. That seems very doable in 12 days allowing to also have time to enjoy Chamonix for a day or more. Great to read your blog! It sounds like an amazing experience. Do you think it’s possible to mountain bike the GR5? Did you perhaps see bikers on the route? I saw one person biking the Pyrenees and that was tons tougher than the terrain on the GR5. It’s doable, but I don’t know about the rules of bikes on that trail.